I think we can all probably agree that the absolute part about traveling is, well, the traveling! You just want reach your destination and enjoy start of a MAGICAL vacation. The car rental lines, the baggage claim and trying to navigate the airport are all road bumps in your journey…well, not when you stay on Disney property! Did you know that you when you stay at a Disney resort, you get FREE transportation to and from the airport and they collect your bags for you? 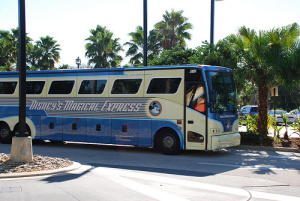 Thanks to Disney’s Magical Express, your vacation can begin hassle free. Today, I want to discuss how staying on property have some wonderful benefits starting right when you step off the plane. Checked Luggage- Before you check your bags at your local airport, you will attach special yellow luggage tags (sent to you by your travel agent) coded with all your Disney resort information. You will not need to pick up these bags at baggage claim, they will magically be delivered to your guest room at your resort! Carry on Luggage- The items you travel with can be securely stowed under the motor coach and smaller personal items can be carried on the bus. Once you arrive at your resort, the resort can store your items until your room is ready. If I have an early flight I always do this so I can go and enjoy the park before my room is ready. Magical Express Desk and Documents- You will receive a book with simple directions to the desk and it will also contain your flight information and transfer information. When you see the desk, you will proceed to the cast member directing guests to their buses. You do not need to stop at the desk. unless you need special assistance. With the introduction of MagicBands, your information will be loaded to your band and you will simply scan your band before getting in line for your bus. On board Magic- The drivers are always very friendly and you watch a video about all the fun you will have while visiting Disney. The video also reminds you of the check in process to make everything simple. I have seen the DME video countless times but I still love it. You KNOW you are minutes away from your magical vacation! Drivers usually point out when you are actually going to enter Disney property and the bug purple welcome sign! One more note, this is something that can be booked by your travel agent along with everything else for your Disney trip to make your trip truly hassle free! One of the best things about a Disney World vacation is being immersed in all of the MAGIC that Disney offers. One sure way of being a part of the MAGIC is to book a Disney vacation and stay in the midst of all the magic on property in one of their resort hotels. 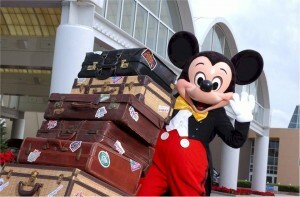 There are 24 resorts to choose from on Disney property ranging from value all the way to deluxe. Each one has its own theme and style and fits every budget. From the All-Star resorts in the value category, to the pure luxury and elegance of Disney’s flagship resort –the Grand Floridian Resort and Spa. There are many ways to get around the Walt Disney World Resort. I suppose I should start with Disney’s Magical Express which takes its guests from the Orlando International Airport to the individual Disney resorts. That is a fun bus ride with the video that gets everyone all excited about their upcoming vacation. Once on property, there are the Disney buses which run all day and into the evening, transporting its guests to the different theme parks and resorts as well the water parks and Downtown Disney. These buses are always available and are a great way to get around. They are clearly marked as to their destination and easy to find them. The Disney buses run from theme park to theme park and theme park to resort. They also run to Downtown Disney and back to the resorts/theme parks. Anyone who knows and loves Disney has a soft spot for the beloved monorail system. There are 2 monorail lines that guests can ride. One is the Magic Kingdom monorail line which runs in a constant circle from the Ticket and Transportation Center, to Disney’s Polynesian Resort, Disney’s Grand Floridian Resort and Spa then to the Magic Kingdom, through Disney’s Contemporary Resort and finally back to the Ticket and Transportation Center. We all love this mode of transportation and who could forget…..”mantengase alejado de la puerta.” There is a 2nd monorail line running from the Ticket and Transportation Center to EPCOT and back. This is about a 10-15 ride which is quite relaxing and fun. There are also ferry rides from the Disney “Magic Kingdom” resorts to the Magic Kingdom and from the Downtown Disney resorts over to Downtown Disney. This is another relaxing and fun way to get where you want to go using another mode of transportation. When you stay on property at a Disney-owned resort, all of these modes of transportation are available to its guests all day, every day. You can decide on the spur of the moment which suits you best and perhaps use another mode of transportation later that day to change it up a bit. Whatever mode you choose, you will have fun getting around the Walt Disney World Resort and make it a trip to remember forever. Contact me to learn more about the various modes of transportation at Disney World and to learn all about all our FREE Disney vacation planning services!